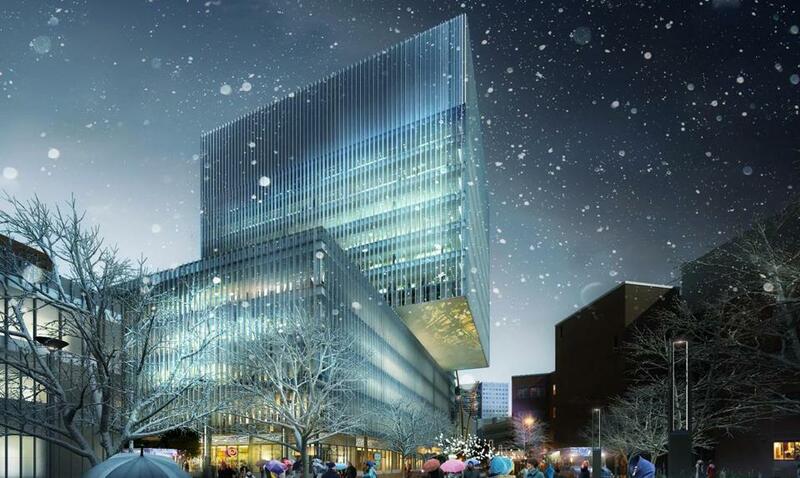 An artist’s rendering of some of the development MIT is planning for the Kendall Square area in Cambridge. The lines between the Massachusetts Institute of Technology and Kendall Square have been blurring for decades. On Tuesday, they came a little closer to being wiped out altogether. MIT officials are set to celebrate the groundbreaking of what they call a “new front door” to the university, a 343,000-square-foot office building at 314 Main St. in Cambridge. It’s part of a six-building, 1.8-million-square-foot assortment of office space, housing, and street life that MIT is constructing in the booming business district at the eastern edge of the school’s campus. And it’s just the first of two massive projects — the other is a massive makeover of the federal government’s Volpe Center a block away — that MIT promises will transform Kendall in the decades to come. MIT officials outlined their aims for Kendall Square in a talk Tuesday morning as part of HUBweek. The new projects, they said, are just the latest in a long-running effort to connect the brainpower of one of the world’s foremost research universities with the business community around it. That mix has made Kendall Square a destination for some of the biggest names in life sciences, technology, and advanced manufacturing. 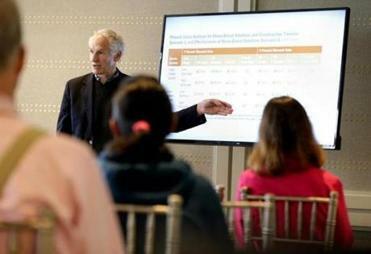 The discussion, part of the HUBweek ideas festival, was held a day after the release of a stark United Nations report on global warming. The Boeing Co. recently said it will lease 100,000 square feet in MIT’s new building at 314 Main St. for a subsidiary — launched by MIT grads — that develops automated flight systems, while MIT is in talks with a variety of companies for the rest of the space. Google is considering taking space in an 18-story office tower being planned by Boston Properties across the street. In addition, major pharmaceutical companies have taken up residence on seemingly every other corner, while hundreds of startups are vying to be the next big name. All of these smart people are piling into such a small space — Kendall Square proper is just 1 square mile or so — for one main reason: to be near one another. Katie Rae, CEO of The Engine, an MIT-affiliated startup accelerator on Massachusetts Avenue, said founders choose to start their companies near Kendall — despite its costs and complications — because of the easy access to so many people, from so many disciplines, who can help them solve the challenges every young company faces. Creating the sort of environment that encourages those conversations — the “human collisions” that spark innovation, as Ruiz put it — is a big part of MIT’s goal for its new buildings along Main Street and at the Volpe site. The school is planning a variety of retail space, including a Roche Bros. that will be the neighborhood’s first supermarket, along with open space, and approximately 1,700 new apartments and condominiums across the two projects. It’s the next phase in the evolution of Kendall from a business district to a full-service neighborhood, said Steve Marsh, managing director of real estate at MIT Investment Management Co.
MIT, already Kendall’s largest landlord and the engine of many of its ideas, will be at the center of it. The buildings on Main Street will also house the university’s admissions office and a relocated MIT Museum, around a central plaza that university officials say will help connect MIT to the neighborhood it helped create.